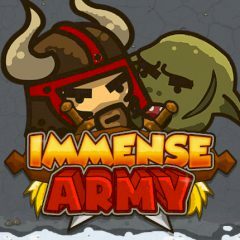 This is the best game, where all you do is click yourself silly, both to generate more troops and gold, as well as help your army out against enemies and other strange creatures. Buy the way, each building you buy generates a certain type of warrior, who can be made stronger if you've got the cash, and when you send them out to fight, their strength determines how well they clout enemy forces, who can be captured to toil in your mine for mo' money, incidentally. So, if you are ready for such a challenging game, then do not waste your time and start the game!